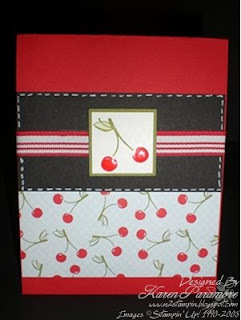 Okay, SO this isn't Cherries Jubilee but the card does have cherries on it! They are so very yummy looking...and they make me happy. Kind of reminds me of summertime! This card showcases the cherry stamp out of the Tart & Tangy stamp set which is still available for purchase till the end of June. I also added a little shine on the main image with the Crystal Effects. I don't think you can tell that from the photo. I just love this Tart & Tangy stamp set and the Summer Picnic Designer Series papers to coordinate so well with it! It is such a fun set to use! I just had a class this past weekend that featured this stamp set and everyone who attended received this set as part of their card kit. Maybe I'll post some of those card samples that we made sometime later this week. Here's what I used for this one. Enjoy! I would like to say thanks to everyone for the kind comments about my blog. It is a learning experience for me. I hope that you enjoy it as much as I am enjoying it! I hope to add a calendar link soon so that you can view my upcoming class schedule and see what things I offer in the way of "Classes by Mail" too. Please be sure to leave me a comment about my blog and this new card and feel free to contact me with any questions you might have! Fantastic! You did a great job and I look forward to checking out your blog on a daily basis. We really like the cherry card. It looks so yummy and summery. We had lots of fun making it too! We can't wait for Saturday so we can make more cards with you!